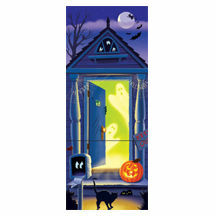 Friendly ghosts, a black cat and jack-o-lantern will greet your trick-or-treaters. Spooky eyes will be watching from the mailbox, under the steps and even from the roof peak. A witch and bats fly overhead in the moonlight to complete the happy Halloween feel and the most fun front door on the block!